It’s always exciting to feature work by a new artist in the gallery. Emma Dunbar is our latest ‘discovery’ and we’re over the moon to show her paintings for the first time. 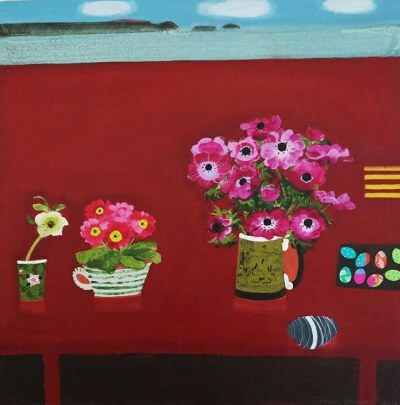 This fabulous piece ‘Pink Easter Anemones’, currently takes pride of place in the window. If you’ve walked past the gallery in the past few days you can’t fail to have noticed it – it’s big, bright and beautifully eye-catching. We love the seasonal Easter theme (how sweet are the little Easter eggs?) and the anemones set against the deep red.